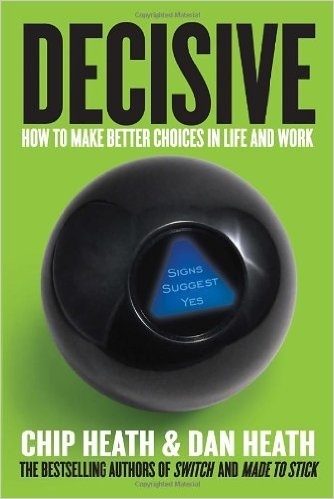 I love Decisive, I think it’s one of the most practical “decision theory” books out there. They break down many of the biases and heuristics covered in other books in a way that makes them easier to manage, instead of simply pointing them out and saying “well, have fun!” This was one of the first books that turned me on to the psychology of decision making, and I’d highly recommend it to anyone who wants to be a little smarter and more rational. The core difficulty of decision making is that we tend to do it without thinking based on what’s immediately obvious, we forget to look around and get all the information we need. The pros and cons list doesn’t work. It’s open to too many biases and heuristics, ignores weights, and a host of other issues. Whenever you think you have an “either or” decision, see if you can make it an “and” (this and that instead of this or that). Avoid narrow framing: “…the tendency to define our choices too narrowly, to see them in binary terms.” Add options, don’t think either or, think about opportunity cost, ask what would happen if your current options disappeared. Avoid the impact of short term emotion. Sometimes an effective way to analyze a situation is to ask yourself what someone would do if they were dropped into it with no prior history with the situation, no emotional attachment. Avoid overconfidence: We tend to be overly confident about what the future will hold, especially after we’ve made a decision. We want it to be true. Adding more alternatives improve decision making. When you treat something as a “whether or not” option, you tend to make worse choices. A good rule of thumb with options is to keep searching until you fall in love twice. Multitracking, considering multiple options at once, can improve decision making significantly, help prevent egos from getting hurt, so long as you don’t add too many options and so long as they’re real good optoins. Find someone who’s solved your problem: Find the “bright spots” inside your organization (see Switch), create decision “playlists” based on best practices, “ladder up” to come up with new ideas (swimsuit designs from “things that swim fast”). Consider the opposite: Constructive disagreement is necessary for organizations to function well and for us to make good decisions. Ask disconfirming questions to avoid the confirmation bias. Test your assumptions with deliberate mistakes. Zoom out, zoom in: Trust reviews for big decisions (jobs, college majors) too, not just for small ones (restaurants). Don’t assume your case is different from the typical (your restaurant is probably not special). Look for base rates. Ooch: Run small experiments to test your theories, fire “bullets then cannonballs” (see Lean Startup). Use the “10/10/10” strategy to question your decisions. How will you feel about them in 10 minutes, 10 months, 10 years? Agonizing decisions are often a sign of conflict between your core priorities. By identifying and clarifying your core priorities, you can make other decision making easier. A “premortem,” identifying why something would likely fail, can help prevent against those failures. You can do the same to identify what will make you succeed. If it’s a year from now and you’re wildly successful, what most likely led to it? Use deadlines and tripwires to kick yourself out of autopilot, and to prevent yourself from doubling down on bad decisions. We spend much of our life on autopilot. Have a reflection ritual.